Terrified shoppers watched in horror as a car drove into a pedestrian area and knocked down a 15-year-old boy in Dublin. The car was driven at high speed through a paved area reserved for pedestrians at Blanchardstown Shopping Centre, and hit the youth. The boy was knocked to the ground and lay motionless as the driver stopped his black BMW 5 Series car and turned it around, and drove back out through the pedestrian area, which is cordoned off by bollards on both sides. Women in nearby restaurants screamed as the car sped past, just inches from the windows. Another youth who was walking with the victim suffered a grazed leg as a result of the incident. Emergency service personnel treated the boy as he lay on the ground, putting his neck in a brace and covering him with a blanket before taking him to hospital by ambulance. 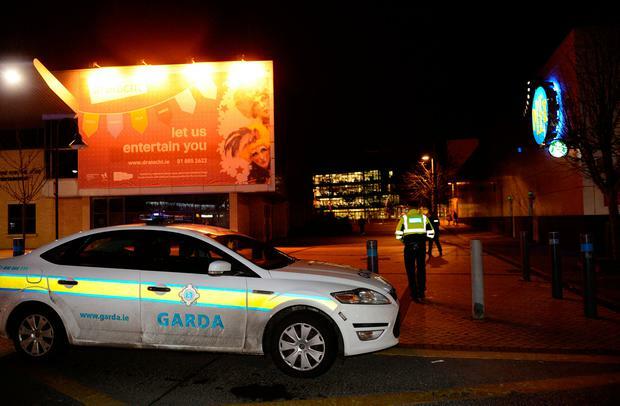 Gardai said that the young teenager remains in hospital this morning. One witness said it appeared the driver of the car was determined to knock down the youth. The car drove at speed for more than 40 metres in the pedestrian-only area before hitting the victim. The incident happened shortly before 5pm after a violent row between two groups of young people in the area. Gardaí said they were searching for the car and driver, who left the scene of the incident immediately. A 28-year-old mother-of-one, who was sitting with her daughter and mother in the nearby Starbucks coffee shop, said: "The driver drove down the path and knocked the guy down. He turned the car back around after the guy was knocked down and sped off again. "It was deliberate. Definitely deliberate. "There was also an argument going on between youths near the Leisureplex nearby." She added: "We came out of the restaurant and we could see the guy who was hit by the car lying on the ground. He wasn't moving. There was a big commotion. "The driver was in danger of hitting loads of people when he was speeding on the pavement. "Three girls sitting inside the window in Starbucks got the fright of their lives because the car actually drove within inches of the windows like a flash of lighting. "It was very frightening, to say the least." The woman's 60-year-old mother also witnessed the commotion. "The girls beside us who saw it were very upset," she said. "Staff screamed at people to get back inside and they locked the doors." A manhunt was under way last night for the suspect in the case who is believed to be from the Tallaght region.